This is a painting of urban landscape.In the picture, primary colors not only divide the screen into three parts perfectly, but also show the uninterrupted different light of seasons anddays.In order to connect the two separated parts, the author also used the green and orange to make the screen more harmonious but not abrupt.In shaping, the author also used large strokesto make an obvious segmentation of relationship between the front and the back,what?¡¥s more, he used some thick paint coverage to create a texture effect.In the center of the picture, the color is more complex and rich, white dots have a striking contrast with shadow scene and depict the crowds and the bustling streets of the city.The authors dealt with the upper and lower portions of the screen cleverly. The behind scene combined with white and pale purple, which make the scattered feeling of construction more obvious and enhance the sense of three-dimensional, severalcures run through in the lower part of the whole picture are very imposing and broke a sense of monotony. 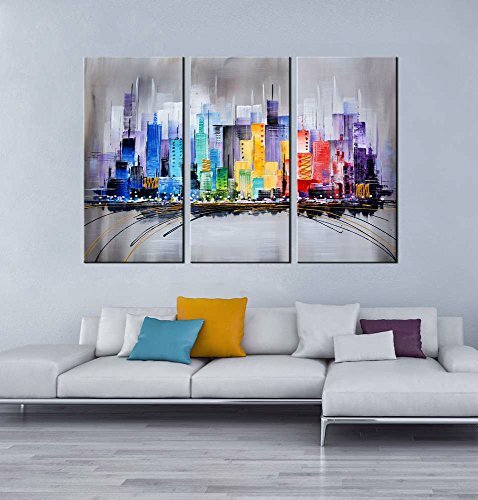 The painting also expresses that the author is full of passion for the life in a big city and longing for the future.